A wildly creative Gothic fantasy retelling of Frankenstein, This Monstrous Thing is a wholly new reimagining of the classic novel by Mary Shelley and is perfect for fans of retellings such as Cinder by Marissa Meyer, fantasy by Libba Bray and Cassandra Clare, and alternative history by Scott Westerfeld. In an alternative fantasy world where some men are made from clockwork parts and carriages are steam powered, Alasdair Finch, a young mechanic, does the unthinkable after his brother dies: he uses clockwork pieces to bring Oliver back from the dead. There is something so fascinating about the story of Frankenstein that both frightens and compels us to enter the world where mad science and creation mingle. When I first read about THIS MONSTROUS THING, I knew I wanted to experience this book! 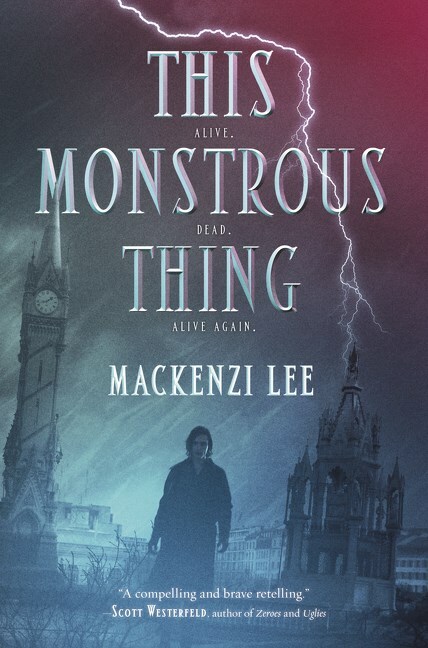 I’m a fan of retellings, and Mackenzie Lee did not disappoint me with a unique twist to this classic. Imagine Mary Shelley’s dark and Gothic tale Frankenstein, now imagine a creative retelling where clockwork men and steam powered carriages are thrown into the mix, add to that the strong bond of two brothers, one death and resurrection, an uprising, heartbreak & romance, plus - one surprise character, and you have the beginnings of Mackenzi Lee’s highly imaginative debut, THIS MONSTROUS THING. The story takes place Geneva and Ingolstadt in the year 1818. I loved how the story took the time and setting to give the whole story a lush, yet dark feel. There’s the historical turmoil of a revolution and war that have ended in the background alongside the culturally rich setting of Geneva with its clockwork tower, cobblestone streets, and steam-carriages that mix with the infamous Castle - abandoned and dreary, which holds secrets of mad science, and in this alternate world, the creation of Frankenstein thorough mechanical use of clockwork parts. Cogs and gears, screws and bolts - that will never seem the same after reading THIS MONSTROUS THING! One of the best parts of the book, in my opinion, is the strong brothership that is explored, which gives readers so many emotions to ponder and empathize with. Both Alasdair Finch and his brother Oliver, are mechanics called Shadow Boys, those who use clockwork parts to secretly heal people, many damaged from the wars or hurt from the industrial machines. When Alasdair loses his brother to a terrible accident, he uses his forbidden knowledge to bring his brother back from death. THIS MONSTROUS THING is about siblings, it explores their bond, and how far would one go to save one. It questions what is redeemable and what is going to far. The heartache, love, abhorrence, and acceptance are all there between Alasdair and Oliver - and you will be taken on an emotional ride with them, a completely worthwhile one! THIS MONSTROUS THING is a not to be missed story for fans of Frankenstein and retellings, especially lovers of reinvented classics. Readers are treated to a clever mix of a historical and alternate world, people, and places all wrapped in the Gothic - Clockwork goodness of a reinvented Frankenstein. Please Note: A courtesy review copy of this book was provided by Katherine Tegen Books in exchange for my fair and honest review. Thank you, Katherine Tegen Books for review opportunity.